Like you, I’ve been taking some time to process the heinous acts of white supremacist terrorism in Charlottesville earlier this month. While news cycles plow forward, my thoughts are still with the people of that city and with everyone feeling the ongoing pain inflicted by persistent systems and acts of white supremacy. For many of you reading this, the events in Charlottesville were not at all surprising; for many others, they served as a wake-up call to delve more deeply into understanding white supremacy at the personal and systemic levels. No matter where each of us may be on our journeys toward understanding and ultimately disrupting the effects of systemic racism, it is important for us to individually and collectively continue to engage. It is with that in mind that I wrote to the Leading Educators’ staff shortly after the tragic events in Charlottesville and shared reflections from some of our teammates, each of us calling on each other to recognize the privilege and responsibility we all have to say and do something. We shared our thoughts on how the unabashed parade of hatred and bigotry we saw in Charlottesville is but a symptom of larger systemic oppression that has targeted people of color since this country’s founding. Following the example of counter-protesters who took action in the face of hate (including a great many educators), we are steadfast in our belief that we must be even more committed to owning our personal responsibility to dismantle white supremacy in our institutions - be they nonprofits like Leading Educators or the school districts from which our students and families rightfully expect excellent, bias-free education. As CEO, I am thinking about how we as an organization move beyond simply talking about systemic racism internally and in our work with teachers, schools, and districts. First, we know we don’t have all the answers, so we are looking to our friends and colleagues for resources and reflections to spark the necessary and difficult conversations. Here are a few from TNTP, Education First, and Facing History and Ourselves that we have found valuable. Thank you to you all. Next, we are focusing our efforts on tangibly addressing our own institution’s systemic racism using readings like this. Informed by a cross-functional, diverse Equity Working Group, we are creating better systems to foster collaborative and inclusive approaches to our work. To ensure that we have the knowledge and skills needed to align all of our work to diversity, equity, and inclusion principles, we are engaging in cycles of professional learning about issues of equity in small groups and developing affinity groups. To be sure, we, like so many others in our sector have a long way to go as illustrated in this report from the New Schools Venture Fund and Promise 54. Our curriculum features teaching for social justice as a core component, and we will continue to collaborate with our partners around learning systems that maintain high expectations through a rigorous curriculum. All children can and deserve to grow without the shadow of bias limiting their opportunity to experience the joy of learning and to reach their fullest potential. Additionally, we continue through partnership with experienced, diverse educators to adapt our programming to ensure that our work results in students learning in safe, equitable schools alongside teachers who acknowledge and control for their biases. This work by individual educators is hard but powerful, and it requires teachers to commit to walking a long, shared journey over time. In this video from our summer institute, several teachers speak to the emotional impact of this processing and the implications they see for their instructional practice moving forward. We are hopeful about the conditions we can collectively build for students to discover and harness their full potential. In order to do so, however, we must push for educators to see the necessity of their own personal growth - coupled with explicit conversations that bring about further awareness of identity and racial equity. We know there is even more we can do, and we are inspired to take action with you. Please take the time to share what you, your schools, and/or your organizations are doing to seek out opportunities to learn together. Michelle Morrow is the Instructional Specialist at North Godwin Elementary School in Grand Rapids, MI and part of the 2017 Leading Educators Grand Rapids cohort. She attended the Leading Educators Institute (LEI) with her team in June. Michelle spoke with us about her biggest takeaways from the week of learning and her vision for school transformation this year. LE: What are the most urgent student needs in your school building? MM: Amid the adoption of the Common Core State Standards (CCSS) several years ago, we have experienced growing pains at North Godwin around aligning instructional approaches to the shifts. Given that we work with an at-risk population, the CCSS required us to significantly shift our instructional strategies in order to ensure that our students were mastering content and on track for college and career readiness. This came with difficult transitions that we are still trying to work our way through today, particularly meeting new ideas and shifts in our teaching approaches with openness and a desire to learn. At a time when test scores can seem heavily weighted, we are finding it difficult to frame the opportunities that come from more rigorous teaching and learning for teachers and students. While this is a challenge, we have gradually seen our staff embrace personal development and dip their toes into the water. Our students are collaborating more than they ever have, and they are engaging in deep, meaningful dialogue with each other, which is incredibly exciting! LE: What do opportunities do you see to build on these successes? MM: Students in our school need to be exposed to a curriculum and teaching practices that are directly aligned to the standards. I feel that the focused content learning at LEI opened my team's eyes to how to make rigorous content accessible to our students. We have learned how to create a more equitable environment for our students. LE: Looking specifically at teacher practice, how has your thinking or approach to professional learning for teachers shifted as a result of LEI? MM: There is so much I am excited about! In particular, I think about finally using data to drive meaningful instructional shifts rather than getting stuck in our old pattern of looking at data, making adjustments, and never returning back to a connected plan to see if those changes actually had an impact on students. I am excited about the laser focus of the Cycle of Professional Learning (CPL) structure and the way in which it connects professional learning aims. Through the Leading Educator experience so far, I have learned that we have missed a large component of professional learning in the past that is needed to truly shift our practice and our thinking as adult learners. Seeing ourselves as learners in this process is key in creating significant impact for our students. LE: How can we best provide support for the student and teacher goals your team is prioritizing? What do you hope to gain from being in the Leading Educators program? MM: Leading Educators has already reignited passion for improving instructional practices among my team of teachers that attended LEI! The learning experience was intense, but we are excited to bring the CPL process to our entire staff and use it as a tool for school transformation. My team chose to seek out Leading Educators in the hopes of sparking new thinking and deepening our understanding of current education trends. We all have a passion for the education field and in particular urban education. Through Leading Educators we are looking for our thinking and approaches to be challenged so we can continue to grow and impact the students we teach. LE: What would you like others to know about your experience at LEI? MM: LEI was one of the most intense and rewarding professional opportunities in my career thus far. This work is not for the faint of heart! Through the LEI experience I have realized what an incredibly challenging and difficult line of work we are in, and it has inspired me to continue to dig in and challenge myself both in content knowledge and instructional practice. 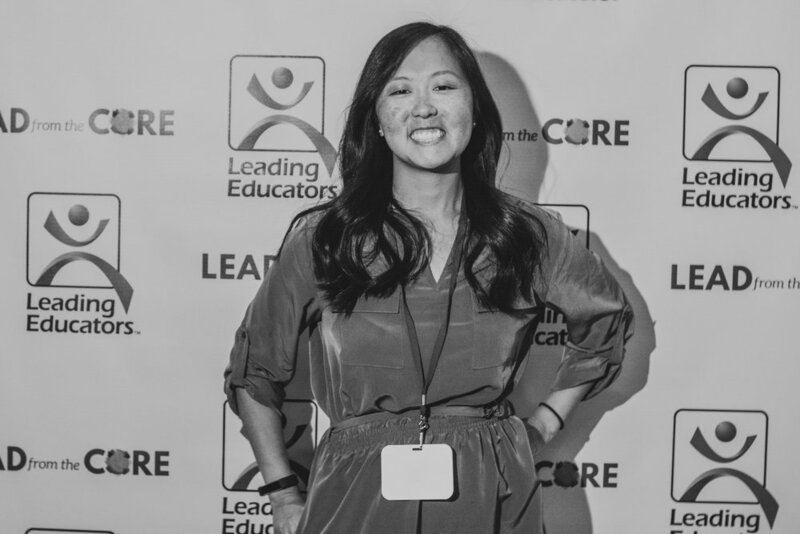 Kelly Compher is a teacher leader at North Godwin Elementary School in Grand Rapids, MI and a member of the 2017 Leading Educators Grand Rapids cohort. This past June, I had an incredible learning experience at the third annual Leading Educators Institute (LEI) with my team from North Godwin Elementary School in Grand Rapids, Michigan. One of the most exciting experiences over the course of the five days of learning was the opportunity to reflect on how we use data to set goals for our students at North Godwin. For context, our school has been actively engaged in the process of looking at student data as the basis for setting student learning goals and developing an ambitious action plan to meet those goals. We have a strong desire to respond to the trends we see in the data, and we have much to celebrate about our current practices. However, we have consistently faced gaps in our ability to revisit previous goals to measure progress against teacher actions in our action plan. We tend to move on to the next problem without fully resolving the current one. As a result, we continue to miss opportunities to get better as teachers. By utilizing the Cycles of Professional Learning (CPL) approach we explored at LEI, we will be going into this next school year with a more structured, embedded process for examining our goals and identifying adjustments. The key shift under this model will be utilizing our data to inform what we, as teachers, need to learn to achieve our goals. We have always been so focused on what students need to know to achieve their goals, that we forget to consider the instructional supports that teachers need to move their students forward. For all of our students to be successful, we have to be purposeful about how we are working together as adults to learn and build skills. As I look ahead, I’m excited to take all the learning we did around literacy at LEI and apply it to the CPL learning I’m designing with my colleagues. The English and language arts sessions that we attended that focused on text complexity and text dependent questions could be the missing link as to why our changes in teaching to the Common Core State Standards have not yet been as successful as we had intended. In order for us to take advantage of this new learning fully, we will all have to show vulnerability and approach our practice with a growth mindset. Showing vulnerability is often a challenge among adult learners because it can spark uncomfortable emotions. As a teacher leader, it is my responsibility to help my colleagues work through personal barriers and misconceptions to create a safe space for learning. The Leading Educators Institute reignited my passion for teaching and inspired me to be a part of greater change. I hope to reignite and inspire my colleagues to transform their teaching as well, so that we can provide an excellent education for all of our students. How can we best connect teacher leadership to professional learning? What do schools sometimes get wrong - despite their best intentions - and how can we help more schools get it right? With the publication of Igniting the Learning Engine: How School Systems Accelerate Teacher Effectiveness and Student Growth Through ‘Connected Professional Learning', the nonprofit organization Education Resource Strategies highlights promising practices at four leading school systems. They offer examples of what it looks like to deeply connect professional learning to the everyday work of teachers and teacher leaders and to a coordinated, system-wide strategy for student success. They also explore how these systems organize resources like people, time, and money to make this happen. As a national organization focused on the development of teacher leaders, we at Leading Educators are acutely aware of both the challenge and promise of connected professional learning. With regular opportunities to collaborate and deepen instructional expertise, teacher leaders can play a key role in improving student learning. At the same time, we know that teacher leaders are part of a larger connected system within schools, and their success often depends on the presence of content experts, access to high quality instructional materials, and the necessary time to work with colleagues. Since 2012, Leading Educators has served as a key strategic partner to DC Public Schools (DCPS), one of four systems profiled in the ERS paper. At the beginning of the partnership, DCPS had just received a federal grant through the Teacher Incentive Fund to increase opportunities for teacher leadership, building on the district’s previous work on teacher evaluation and compensation. Leading Educators partnered with DCPS to provide technical assistance, drawing on our long-standing work with teacher leadership programs in New Orleans and Kansas City, Missouri. Leading Educators worked with DCPS to launch the Teacher Leadership Innovation (TLI) program at a pilot group of seven schools. In the early years of the program, schools had great latitude in creating teacher leader roles. This meant that school leaders were highly engaged in the process but also that roles varied widely. While these roles added capacity for school leaders, they were not exclusively focused on examining student work or building teacher skills. For many teacher leaders who were new to leadership positions, coaching their former peers created challenging dynamics. Additionally, some schools struggled to protect release time that had been allocated for teacher leader functions when staff turnover occurred and emergencies arose. As TLI expanded, structures, systems, and training were gradually put in place to address many of the lessons learned from the first cohort of schools. Over time, new teacher leader roles became more narrowly focused on what the paper refers to as “content-focused, expert-led collaboration” instead of tackling both administrative and learning functions. This ensured that principals aligned the roles to the key instructional priorities of their schools. To support TLI participants’ transition into new leadership roles, the program content focused heavily on developing both hard and soft leadership skills. DCPS also focused on helping new teacher leaders develop adult leadership skills. Leading Educators partnered with the district to provide sessions focused on relationship management, addressing topics such as difficult conversations, team dynamics, influence with and without authority, and conversations about difference. This content translated leadership best practices into normed processes and tools. "The Theory of Action serves to anchor the school in its priorities, not just for students and teachers, but also anchors the leadership team in the commitments they’ve made to teachers. By establishing these priorities and commitments collaboratively, the Theory of Action supports alignment and a shared understanding of priorities. Each quarter, a Leading Educators Leadership Coach leads the leadership team to analyze student and/or teacher data to assess what has been accomplished and what may need to be revised. This data cycle - setting goals, assessing progress, and course-correcting - is something many schools do for students. It’s far less frequent to see schools doing this type of analysis for teacher goals and for leadership goals. Our schools emerge from Quarterly Data Reviews not only clearer on the next quarter’s goals for students, but also goals for teacher instructional practice and the leader actions they will take to support teacher development in those instructional practices." Finally, the DCPS central office team, in partnership with school leaders, began to research, create, and share innovative scheduling approaches that would create more release time cost neutrally. With coaching, school leadership teams developed contingency plans so that they could provide sufficient time for productive collaboration even when unforeseen challenges emerged. These efforts laid a strong foundation for LEAP. With LEAP, DCPS is leveraging distributive leadership to improve instructional practice in content-specific and job-embedded teams. LEAP has ignited the learning engine by empowering principals and teacher leaders with the structures and tools to drive continuous improvement.